Air Conveyor handles wide variety of containers. Utilizing air and louver patterns in air deck, AMBEC Baseblow Air Conveyor can transfer metal cans, PET bottles, HDPE bottles, caps, pucks, and boxes while ensuring containers remain upright. Metal cans can be conveyed at speeds of 2,000 cpm, while PET or HDPE bottles are transferred at 500 bpm. Fast gap-makeup capability allows for condensed layouts or increased accumulation. Options include rapid adjust hold-downs and auto-adjust rails for quick changeover. 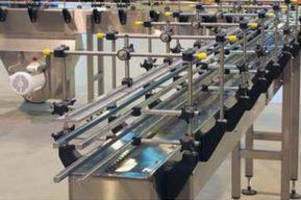 ROMEOVILLE, Ill. - FleetwoodGoldcoWyard has revealed its AMBEC Baseblow Air Conveyor. This conveyor utilizes air, along with louver patterns in the air deck, to convey a variety of containers, including metal cans, PET bottles, HDPE bottles, caps, pucks, boxes and more. Although each application is unique, metal cans can be typically conveyed at speeds of 2,000 CPM while PET or HDPE bottles typically are transferred at 500 BPM. Characteristic to its design, the AMBEC Baseblow Air Conveyor requires minimal maintenance as compared to a mechanical conveyor. The unique design of the conveyor allows containers to remain upright so there are no downed containers, and the lightning-fast gap-makeup capability allows for condensed layouts or increased accumulation. Optional features include rapid adjust hold-downs, auto-adjust rails for quick changeover, customized louver patterns, and transfers to and from a mechanical conveyor. For companies wishing to test out their products on the AMBEC Baseblow Air Conveyor, FleetwoodGoldcoWyard has developed a test loop system. Tests can be captured on video for review by the client. Contact our experienced Sales Department to discuss your application and to send in sample product to be tested. Barry-Wehmiller Companies, Inc. is a diversified global supplier of engineering consulting and manufacturing technology solutions in packaging, corrugating, and paper converting across a broad spectrum of industries. Barry-Wehmiller's balanced approach to the market is made possible through nine interactive divisions: Accraply, Inc., a leading manufacturer of automatic labeling and label converting and finishing systems; Barry-Wehmiller Design Group, Inc., a premier supplier of manufacturing automation, facility design, and other engineering consulting services; Barry-Wehmiller International Resources (BWIR), a global provider of business and technology solutions to the mid-market manufacturing domain; FleetwoodGoldcoWyard, Inc., a leading producer and supplier of automated can end and product handling equipment, advanced conveyance technology, palletizers, depalletizers, and process equipment; HayssenSandiacre, a form/fill/seal technologies and services leader for more than 100 years; MarquipWardUnited, Inc., a leading manufacturer of equipment for the corrugated and folded carton industries; Paper Converting Machine Company (PCMC), providing high-performance converting machinery for the global tissue, nonwovens, package printing, and envelope manufacturing industries; PneumaticScaleAngelus, a global provider for filling, capping, can seaming, labeling, and centrifugation; and Thiele Technologies, Inc., a leading producer of placing, feeding, bagging, cartoning, case packing, and palletizing equipment. In fiscal year 2009, Barry-Wehmiller leveraged a strategic combination of organic and acquisition growth to achieve revenues of nearly $1 billion. Barry-Wehmiller now employs more than 5,400 team members in over 65 locations worldwide.